During the mass digitization project at Cooper Hewitt, Smithsonian Design Museum, which has been under way for the last year, twenty Megalethoscope plates of unknown origin were discovered in our storage facility. 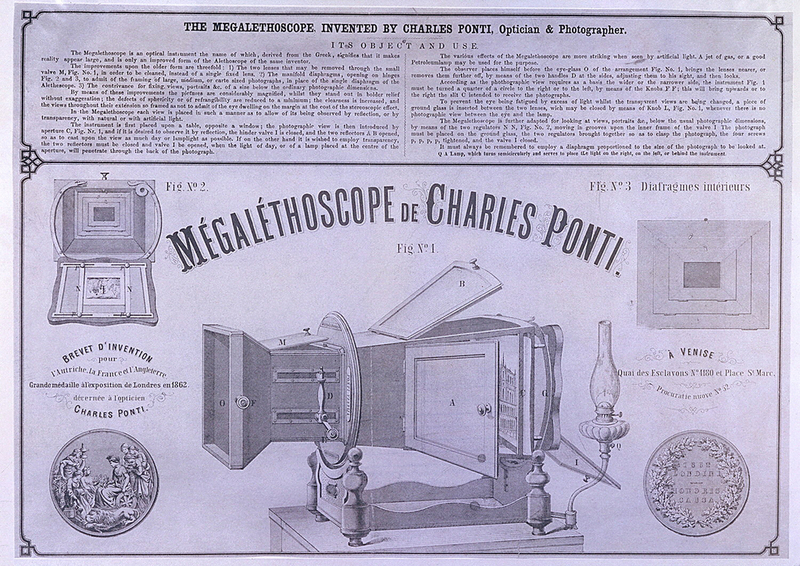 The Cooper Hewitt’s Drawings, Prints, and Graphic Design department collection contains a photostat of an advertisement from the early 1860’s that illustrates the then-revolutionary capabilities of Megalethoscope technology. Ponti was reknowned for his lenses and his series of photographic albums, “Ricordi di Venezia.” He actively edited and published the work of other Venetian photographers as well as his own throughout the 1860’s. Due to administrative confusion during the Austrio-Prussian war and the Peace Treaty of 1860, Ponti lost his copyright and his collaborator Carlo Naya began producing the Alethoscope under his own name. Ponti tried unsuccessfully throughout the remainder of his career to regain his exclusive right to the invention, and died in 1893, completely blind. Image layer: The primary support combines an albumen print, a textile support and a watercolor painted paper sandwich. Tissue layer: A blue tissue paper, watercolor painted/cut out and affixed to the borders on the back of the wooden strainer. Backing layer: The secondary support combines a textile support and a paper sandwich. This creates dramatic day and night light effects, depending on the placement of the light source. When the top of the Megalethoscope is open and light hits the front of the image, we see a daytime scene. However, closing the top and using back lighting, we see the impression/illusion of nighttime. Megalethoscope discovered in Cooper Hewitt storage during mass digitization. The Megalethoscope plate “Panorama di Napoli dal Vomero” (Panorama of Naples from the Vomero), one of the objects found in Cooper Hewitt’s storage during the digitization process, is a well-known view of Naples. A similar image was taken by photographer Giorgio Sommer, circa 1870, held in The J. Getty Museum collection. Panorama of Vomero with Pine Tree; Giorgio Sommer (Italian, born Germany, 1834 – 1914); Vomero, Italy; about 1870; Albumen silver print; 17.8 x 24 cm (7 x 9 7/16 in. ); 84.XP.726.43; Collection of the J. Paul Getty Museum. Institutions containing Megalethoscope plates in their collections include The Getty, The George Eastman House and Firestone Library, and the Princeton Library. Dong Eun Kim is currently working as a paper conservator for the Cooper Hewitt mass digitization project. She has formerly done photo and paper conservation work for the Yale center for British Art, Whitney Museum of American Art, The Morgan Library, and the Metropolitan Museum of Art. Heylen, Sylke and Maes, Herman. Topics in Photographic Preservation, Volume 8. Photographic Materials Group of the American Institute for Conservation of Historic & Artistic Works, Washington, DC, 1999. p. 24. Do you know of anyone who is looking to buy an antique megalethoscope?